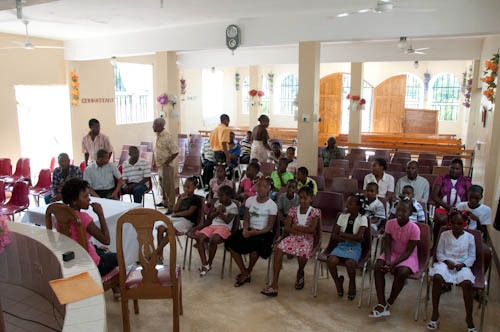 From August 20th to August 25th, 2012, ONET Haiti conducted its 2012 summer camp for an amount of 100 kids. Thanks to the financial support of our two partners Palmerdale United Methodist church through Jerry Powell and Sentry Engineering Group, Inc. through Norm COWDEN, the kids camp took place in Armée du Salut school located in Ave La Liberté, Petit-Goâve, Haiti. Besides this important support by our two partners, the members of the ONET organization did play an incredible role in organizing the event and its implementation. During this third realization, the children along with their parents enjoyed the program and require even much more every year. Our Hundred children approximately ( 90 kids to 102 at the very last day) were proposed a large range of activities where they were called to express themselves. Our hosts made a great job by presenting diferent subjects along with some other social and religious actors in the city. This summer camp which the slogan was ”The country should take off with the children” was a great moment to the children to exchange and learn by doing, playing, praying and eating together with the ONET staff who have learned much more about their wishes. Among the activities which constitute the programme, we had Bible studies, Education awareness, talk on hygienic issues, cleanliness; environment issues, hand craft, drawings, painting, creative works, free performance, role-playing games, foot-ball competition, children Rights, etc. During these three experiences, we have been learning different problems that our society is facing. Parents and kids are excited about this humanitary and social activity, but they also understand that more need to be done as to better assist. It is a great occasion for us to know, through individual talking to kids and parents, that most of them have their report cards held at the school administration because of left over debt. This kind of activity creates a better understanding of the situation of the majority of these needy kids who don’t have entertaining time besides schools. In fact, it is a real annuel ready-to-go meeting that they have every year with ONET to gather and out-school interact with other kids they might not know before. This annual program is the very important place where the members of the Organization get an incentive about our mission to help and support those kids. As a new point, before the last day, the coordinator along with four hosts had a great time by the sea with the young ones talking about the importance of keeping their environment clean. As it is shown in the pictures below, they were excited walking from the camp site on line to the sea side. Seventy-two (72) of them from age 8 to 16 took part in this activity, asked question, made pictures, played, and learned how to be more reasonable towards their environment. A l’occasion de la Noël, O.N.E.T, Òganizasyon Nasyonal pou Ede Timoun, tient à souhaiter de joyeuses fêtes à tous les enfants du pays. Dans une situation où nous ne savons pas exactement notre destinée de peuple digne de vie sur une terre commune, nous pourrions nous asbtenir de ces souhaits hypocrites habituels. Mais sachant que la conjoncture exige que nous fassions des efforts et que nous témoignons de l’espoir envers nos enfants et jeunes – si fictif soit-il -, nous convions tous les haïtiens à faire front commun pour sauver le pays de cette tribulation non méritée. Donc, au lieu de vous faire des voeux de résignations fluides, nous vous demanderions de prendre la période de Noël pour penser sur notre situation de peuple et de prendre les décisions qui s’imposent. Ces décisions peuvent d’abord partir de la façon de former nos enfants sur les valeurs universelles humaines. Ce qui manque à nos « dirigeants » insensibles aux problèmes des autres. Ainsi tenons - nous à rappeller à tous de revaloriser le rôle des enfants dans la sociéte, car ils seront nos futurs dirigeants. Si une telle initiative avait été prise dans le passé, nous aurions pas eu de tels incompétents nous représentant sur la scène internationale. Les situations post-séisme, la catastrophe du choléra, le cyclône, le désordre électoral,... auraient été écartés de nos portes. Luttons ensemble pour sauver la nature dont nous sommes le contenu. Ann sispann di pito nou lèd nou la ! Nou pa bezwen prezidan pou n peye lekol pou yon timoun ! Nou pa bezwen kazek pou n’ ranje yon ti bout wout ! Nou pa bezwen met dife si nou pa kontan ! Si nou moutre nou konn sa nou vle yo pa ka ba nou sa yo vle ! Si nou kwe nan travay, y’ap ofri nou travay pase yo pote lajan abstrè pou nou ! Ann met men nan pat la ! Nou te yon bijou nan zòn nan anvan nou tounen sa nou ye a, ebyen nou ka tounen yon boul dyaman si nou konn valè nou ! Nou pa gen nèj, nou pa gen gè sivil, nou pa gen tsunami,.... ann rezoud pwoblèm sa yo. Konsa nou va tounen pèp nou te ye a ak lòt destine. Se paske lakay pa bon, ki fè lakay zòt gen valè ! Ann itilize sa ki bon kay zòt pou nou geri malad pa nou an nan fason pa nou ! Lè sa a, nou va di tout moun JWAYE NOWEL ! 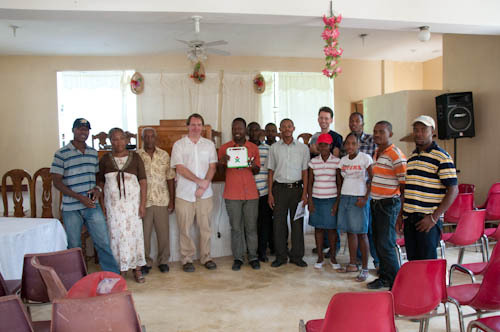 From August 31st 2010 to September 17th,with the financial support of Donators ( Sentryeng Engineering Company, COlvin Steve, Jerry Powell, Heratland Alliance, Solution Center, WFP), members of the ONET organization located in Petit-Goave organized a summer Camp for about 200 kids per days. This activity - as it was stated primarily in the project - is being implementing as to help the kids to enjoy themselves while learning during the Summer Vacations after the Eathquake which stroke Haiti on January 12, 2010. Two meals were served. Parents and CHildren reported that they expect the activity to continue for more weeks. O.N.E.T (in Creole: Òganizasyon Nasyonal Pou Ede Timoun) ‘’ in English (Children Support National Organization)’’ is a non-profit based organization, located in Petit-Goave Haiti, involving in kids related issues. We work especially with children who are in hard difficulties. We hear by vulnerable kids, those who are apparently in bad situation considering their dressing, physical standing and attitude. So, we contact their parents to explain them our intention to them as to help them become useful citizens for themselves and for the country. In O.N.E.T, we have taken the initiative to bring our contribution to the social, behavioral, and educative reconstruction of our Haitian kids. From this kind of thought, we plan to organize a summer camp for the kids as to help to recover after the earthquake which stroke the country on January 12, 2010, and also after the end of the current school year. We have also taken this initiative to prepare them on psychological and social issue face to the upcoming school period. Considering that a great part of our kids in refugee camps are living in precarious situation and that some parents are neglecting their missions, this activity will emphasize on awareness on negatives consequences of their current behavior and new lifestyle. Socially, this activity will help them socialize with other kids. Activities such as role play, sketch, texts and others which will be parts of our program to make them aware of gang related activities, practice of mutual respect, respect of environment, value of education, and a set of activities allowing them to take a better direction. For that matter, we will have a group of qualified persons to help us offer a good activity week to them. We will have some professionals from the community to talk to the kids on a subject appealing their concerns such as education, environment, etc. Thus, besides the entertaining program, a rich program will be presented to them during the whole week. Through this daily based program, they will be relaxing, training, informing and expressing themselves among other kids, especially through the different talks we will implement. Two meals constituting of a breakfast and lunch will be served to them. To end this weekly activity, a party will be organized along with their parents and the different sponsors involving in the realization of the program. c) Re-consider the concept of education, environment, mutual and respect. Finally, as the slogan states ‘’ Help me to support my country’’, may this summer camp be served as fuel to the kids integration engine in the different activities, which will help them to become reasonable and important adults in the future for the real refoundation of Haiti.